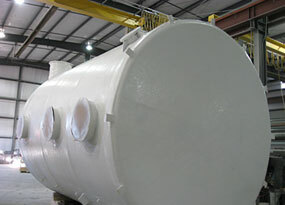 Perry Fiberglass Products manufactures high quality FRP Ductwork products including Air Strippers and Degasifiers. Perry Fiberglass’ air strippers / degasifiers are specifically designed to efficiently desorb or remove contaminants such as VOCs, CO2, etc. from the incoming liquid stream coming from processes, landfill remediation, water treatment, etc. Although desorption (stripping) is the functional opposite of absorption (scrubbing), the same essential type of equipment is used. The contaminated water is introduced at the top of a packed column, while fresh air, void of any contamination, is introduced at the bottom of the column. Traveling a torturous route through the packing extends the contact time between the air and the liquid, as well as, increasing the intimacy of gas/liquid contact. As the air and water move through the column countercurrently to one another, the contaminant diffuses from the water to the air. The water leaving the bottom of the column is cleansed of contaminants. The type of contaminant in the liquid stream, along with the desired removal efficiency will determine the bed depth, packing size, fresh air rate and chemical requirement, if necessary. 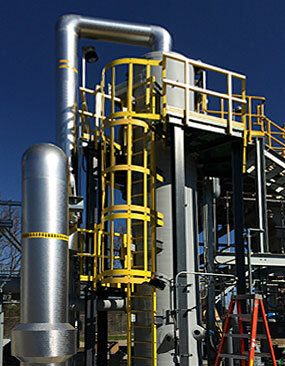 Prior to leaving the air stripper / degasifiers, the contaminant air passes through a mist eliminator (mist eliminator blades or mesh pad) to remove entrained droplets. Our team of experts will work with you to find high quality, cost-effective solutions for your air strippers / degasifiers needs.